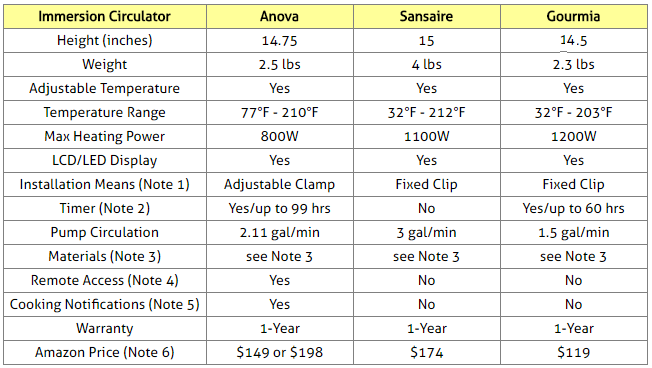 Compare Sous Vide Immersion Circulator Cookers: Anova, Sansaire or Gourmia? ​Sous vide is the method of cooking vacuum-sealed foods in a controlled low-temperature water environment. It allows you to create with ease and consistently perfectly cooked tasty dishes. With properly executed sous vide cooking, thanks to to precise temperature control, the common problems of over-cooking or under-cooking are completely eliminated. Poultry, even the white meat, comes out juicy, steaks turn out amazingly medium-rare, and eggs come out perfectly poached every single time. In addition, when vegetables are prepared sous vide, they retain more of their vitamins and nutrients, taste fresher without losing any of their crunchy texture. This article will provide detailed information on sous vide cooking and compare the Anova, Sansaire and Gourmia sous vide immersion circulators. These were not just the most popular among Amazon customers at the time this article was written, but they had also received excellent reviews from most Amazon buyers. Selected Sous Vide Immersion Circulator Cookers on Amazon. 1. 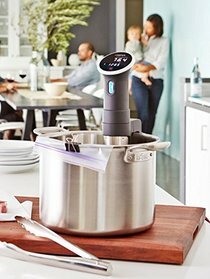 An immersion circulator which is basically an appliance that clips on any pot and turns it into a temperature controlled water bath, perfect for sous vide cooking. Some immersion circulators, like the Sansaire, don't even need to be clipped on the pot; they are simply placed in it. 2. A vacuum-sealer or a food-grade freezer bag (such as BPE free Ziploc bag) to seal your food. 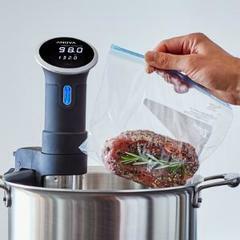 Since sous vide cooks the foods at a lower temperature, it may not kill as much bacteria as more traditional cooking methods would, and therefore it's preferable to use a vacuum-sealer. But many customers have reported that using Ziploc brand bags do the job quite well when proper procedure of getting all the air out of the bag is used (see below). Not only are Ziploc bags BPE free, but they are also much thicker than other generic brands. 3. A pot you already own with sufficient depth for your particular immersion circulator to fit in. 4. A sous vide recipe.​ Note that following your sous vide recipes to the letter is extremely important as the temperatures and other details specified by the recipes are critical to the success and safety of the resulting foods. First attach the immersion circulator to a pot filled with sufficient water for the bottom of the circulator to be in it and so that water is capable of moving around it. Finally, set the appliance to the temperature specified by the recipe. Botulism can become an issue if you commit some sous vide no-nos. If you make sure that you’re cooking at or above the specified temperature and sous vide for an appropriate amount of time (you’ll be sous videing for at least a few hours on most recipes anyway), those pesky bacteria will not get a chance to grow. Some immersion circulators are also equipped with a timer in which case you also set the timer for the specified time. The device will circulate water around the pot for the specified time while ensuring a consistent temperature throughout. Note that many immersion circulators do not have a timer. That is because when cooking sous vide, for safety, you should never allow the temperature to drop to the dangerous levels for extended periods of time, which would happen if the unit was allowed to shut down on its own while unattended. Get all the air out of the bag or pouch where the foods will be cooked. Follow very strictly the temperature settings and cooking times specified by your sous vide recipes. Never leave sous vide cooked foods unattended once the appliance shuts down and the foods are cooked. Eat them or store them right away in the fridge for later. 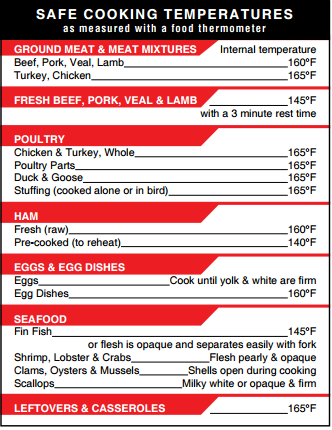 Per FDA recommendations, hot foods should be kept at an internal temperature of 140°F or warmer and cold foods should be kept at 40°F or colder. Anova comes with an adjustable clamp that can be used to attach the appliance to any pot. The clamp can be moved up or down on the circulator's stainless steel skirt so that the appliance may exactly fit the pot. The minimum water depth needed is 3.5 inches. Sansaire and Gourmia do not have adjustable clamps, but are equipped with fixed clips. Sansair's clip has two settings, but the clip is removable and the unit can also be placed directly in the water without the clip. Therefore, it can be used with just about any pot. The minimum water depth needed is 3 inches. Gourmia must always be clipped and requires a pot with minimum water depth of 3 inches. The clip is encased by a heat-safe plastic shield to protect cookware and holds the sous vide pod upright and vertical within the cooking container as the filled food bags cook in the water. The timer on sous vide immersion circulators should only be used if you plan to be around the unit when the programmed time is up and the unit shots down. That is because when cooking sous vide, for safety, you should never allow the temperature to drop for extended periods of time to dangerous levels that can cause the development of bacteria. This could happen if the unit was allowed to shut down on its own while unattended. And that is mainly why Sansaire does not have a timer. With Anova this is not a real issue, because it supports Bluetooth or Wi-Fi based remote communications, and it will send a message to your smartphone to remind that the cooking time is up and that you should remove the food from the plastic bag to eat it or save it in the fridge for later. And if you are not in a position to reach the unit on time, you can simply extend the sous vide cooking time remotely using your smartphone. The food will still come out just as good, if not better! With Gourmia, there is no remote control via Bluetooth or Wi-Fi. Therefore, you should plan to be around the unit when the timer time is up and remove the food from the plastic bag to eat it or save it in the fridge for later. ​Finally, keep in mind that sous vide cooked foods safety is a function of both time and temperature: a temperature usually considered insufficient to render some sous vide cooked food safe, may be quite safe if maintained long enough. These products are made of polycarbonate with stainless steel parts. Polycarbonate is a great material suited well for kitchen appliances. Stainless steel parts prevent rust and corrosion and last for ages. Anova has a version that supports the 4.0 Bluetooth communication protocol and another version that also supports Wi-Fi, so it can be controlled remotely from your smartphone using the free Anova app. With Anova, you will receive notifications on your smartphone when the device is preheating, brought up to temperature and when time is up. So which sous vide immersion circulator to buy? If you are looking for a sous vide cooking appliance that can be controlled remotely, you should consider Anova which is the only one that offers at this time models that support Bluetooth and Wi-Fi communications with your smartphone or tablet. But for most people remote cooking is not a priority, and one aspect that should be considered is the adaptability of the appliance to various types of pots. As explained above, both Anova and Sansaire can be used with just about any pot. All you need is for the bottom of the immersion circulator to be immersed in about 3 to 3.5 inches of water. This is because Anova uses an adjustable clamp to attach the immersion circulator to the pot, and Sansaire, which has a wider base, can simply be placed into the pot without even using its clip. On the other hand, Gourmia has a fixed clip and must be clipped to the pot, therefore it needs a pot that is deep enough for the appliance to work properly. Note also that with Anova, the skirt of the appliance (the part that goes under water) is made of stainless steel and is removable for easy cleaning. Sansaire and Gourmia have no removable skirts. Finally, note that at the time this article was written, Anova and Sansaire had each received an average rating of 4.5 stars out 5 stars from Amazon customers, while Gourmia had received 4 stars.